Everything you need to know about shutter speeds, aperture, and ISO. *All images contained in this document are either being used under a creative commons license or are the author's own work. Before we start lets look at the word “Photograph”. The word was originally coined by Sir John Herschel and won out over “photogene” and “heliograph”. All of three words have Greek origins meaning light, photo or phos and helios. Immediately you should see how relevant understanding light is since it’s built into the word photography. We’re graphing light here! The goal of this article is to explain a little about how light works and how the various features of your camera control it to produce an image. Ideally you'll need a camera that lets you control these settings but even if your camera doesn't allow you to just understanding how these work will still help you greatly. 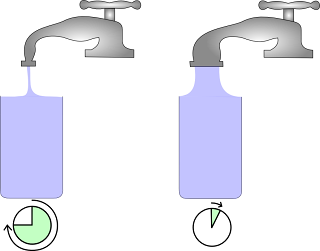 The three main controls you have over light are the time or the duration your film is exposed to light, the amount of light by changing the size of the hole, and the film’s sensitivity to light. Shutter speed. Aperture size. ISO. 1-2-3. Shutter speed, aperture, and ISO all play different parts in contributing to your overall exposure as well as having special properties of their own. We’ll look at them individually and then see how they work together. Regardless of what is inside your camera you’re still trying to capture light, film and digital sensors both accomplish this. With film it is tiny crystals that are sensitive to light (silver halide salts bonded with gelatin), digital sensors have similar things called “photosites” and these too are sensitive to light. Either way you need a certain amount of light to make an image show up, the amount of light depends on how sensitive the film is to light. This is where the ISO number comes in. The ISO rating for film, carried over to the digital realm, is a means of expressing the sensitivity to light. The higher the number the more sensitive to light the film is. For example a film with ISO 400 will need half as much light as ISO200 would need to get the same exposure. 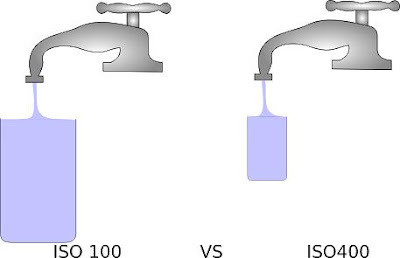 You’ll also notice that ISO tends to work in multiples starting at ISO 50, then 100, 200, 400, 800 and so on. Imagine if you will a tap that will represent shutter and aperture, and a glass that when full is the proper exposure. The water itself is light. ISO would represent the size of the glass that needs filling. The more sensitive to light the higher the ISO and the less light is needed resulting in a smaller glass to fill. There is a trade off however between ISO and image quality, if there wasn’t then we’d always want the high ISO and never use the lower one. In order to make the film more sensitive to light the crystals that are used are much larger (more room for the photons to hit), it is similar in digital sensors but more complicated to explain. By using larger crystals the resulting image will appear coarser or grainier and the same effect occurs with digital. The higher the ISO the coarser your image will look, once you understand the rest about shutter speed and aperture you’ll be able to determine what ISO you’ll need for whatever shooting conditions you are in. You’ll almost always want to keep the ISO as low as you can to get the sharpest photo. That being said, sometimes using a higher ISO can make the image “grittier” and add to the feeling of the image. For example if you’re taking a portrait of a woman and want to imply smoothness and femininity you’d probably want to shoot as low an ISO as possible. If you’re shooting the weather beaten face of a prairie farmer who is tough and hearty you might accentuate those qualities by using an higher ISO for more grain. Chapter 2: Shutter Speed and Aperture regarding exposure. Both of these controls work hand in hand, it is hard to explain one without explaining the other. To help explain these we’ll go back to water as an analogy for light. Imagine again an empty glass representing an unexposed frame, when it filled to the brim means a proper exposure. The time that the shutter is held open is represented by how long we leave the tap on, the size of the tap is representing the aperture. To show you the two extremes we could fill the glass up very quickly or very slowly. If we had a tap that was very small we’d have to leave it on for a long time to fill the glass up, or we could have a really big tap and only turn it on for a short period of time. If we use a big tap and leave it on too long the water will spill over the edge of the cups, or in other words a large aperture and long shutter speed will result in an over exposure. Conversely a small tap not left on long enough won’t fill the cup, a fast shutter speed and a small aperture will result in underexposure. As was stated previously this example shows the extremes, either control can be varied to compensate for the other. Often you'll need to vary your aperture to allow you to shoot at a safe shutter speed to avoid blurry photos. Generally 1/60th is considered safe to shoot hand held, slower and you should use a tripod. Here are some examples, if we were taking a picture of something that is happening quickly we’d want to use a fast shutter speed, or in the case of the water analogy a quick on/off of the tap. Because we’re only turning the tap on for a short duration we’ll have to increase the tap size or “aperture” if we still want to fill the glass. Let’s break away for a second to explain a little more about aperture. The size of the aperture is measured in F-Stops. It’s a little counter-intuitive because the larger the F number the smaller hole or aperture. It might help to think of it as how much light the aperture “stops”, the higher number means its stopping more light. These numbers are setup in fixed increments and depending on your lens you may not have exactly the same numbers. With regards to getting the proper exposure (ie filling the glass exactly to the top) both of these controls are proportional to each other. If we took a photo with a shutter speed of 1/1000th of a second at F8 the exposure would be the same as taking a photo at 1/500th of a second at F16. Since we doubled the time of the exposure (time the tap was on) we had to halve the size of the hole (size of the tap) in order to get the same amount of “water into the glass” or light into the camera. We'll explore the relationship more in chapter 4. Chapter 3: The other properties of the 3 controls. Ok so we've sort of already covered most of this one during the explanation of what ISO is. The special property of ISO, outside of how it affects exposure, is the fact that it will change how your image looks depending on the “grain size”. High ISO images will be coarser and grainier than low ISO images; you'll have to weigh the pros and cons when shooting. Some digital camera's noise is very much like that of film and can look nice in certain shots, other cameras the noise will just take away from the image completely. Some cameras handle noise better than others. A shot at ISO800 using one camera may look like it has less noise than an ISO200 shot from a different camera. Not all cameras are created equal, the point and shoot variety tend to suffer the most with high ISO noise and should normally be kept under ISO 400 if at all possible. How the shutter effects exposure is pretty straight forward, it is like a valve that turns on for specific duration of time letting light into the camera. The special property aside from exposure though is the ability to freeze or expand time. A fast enough shutter speed can stop a bullet in mid air or stop the beating wings of a humming bird. A slow shutter speed can drag out an instant and show motion. There are many ways to use this to your advantage to completely change the mood of a shot. Left. By allowing the shutter to remain open for several seconds the headlights of a car can be seen continuing on as the vehicle moves past leaving a light trail. Right. Using a very fast shutter speed of 1/8000th you can make out the individual droplets of water formed by the jets in a water fountain. 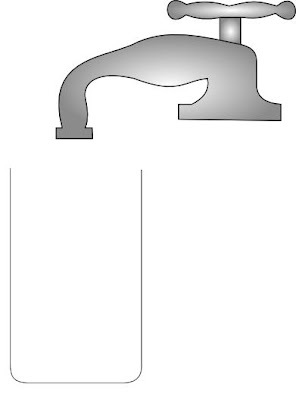 As we saw previously, aperture is basically the size of the end of our faucet or the opening to our camera. The bigger it is the more water flows out or the more light that gets let into the camera. Aperture has not one but two special properties, both have to do with what is called “depth of field” or “DOF”. With a small aperture (high F#) you can have a very large DOF meaning that everything in the depth of field will be relatively in focus. A large aperture on the other hand will of course do the opposite, only a shallow distance will be in focus. Left. This image is using a very small aperture so that the DOF is huge stretching all the way across the riverbank so that both the foreground and background are in focus. Right. The opposite is true for a large aperture, the DOF is very shallow and only extends a few inches in front of and behind the flower. Think of depth of field as a flat plane that has a thickness, as you close your aperture making it smaller the DOF gets deeper or thicker. Everything that is the same distance or “depth” from you will be in the same DOF. Here's a little more information on the topic. If the opening or aperture is small then there is very little variance allowed in the path of light through the aperture. As seen in the image below if the line varied up or down it wouldn't make it through the hole, this results in a sharp image. With a hole small enough you wouldn't actually need a lens to focus, this is the principle behind pinhole cameras. Pinhole cameras have very high F#'s because the hole is so small, F stops of F150 and higher are common. In case you're wondering where the F# comes from it is the ratio of the focal length (distance from aperture to film surface) to the diameter of the aperture. So a 100mm lens set to F4 would have an aperture of 25mm (F#=ƒ/D). You don't need to know this but its interesting to understand the origins. Another place you'll notice this is if you take a picture of bright lights at night or even the sun, the glare will often form a 6 point star pattern. This is because a lot of apertures use a 6 blade configuration that form a hexagonal hole. In case you're wondering if the “out of focus stuff” has a name it does, well sort of. Somewhere along the lines someone started calling it “Bokeh” pronounced Bo-Kuh. 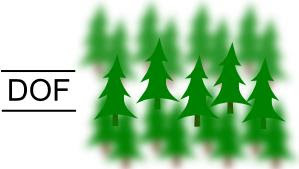 The word is derived from the Japanese noun “Boke” meaning blurry or fuzzy. They also have a dowloadable PDF of it there that is much more suitable for printing. To use this chart you will have to already know what settings will get you a proper exposure. If you have a digital SLR all you have to do is set your camera to auto, take a photo of what you plan to shoot, and then review the image information. Let’s say for this example your camera determines that 1/60th of a second at ISO200 with F8 is properly exposed. Unfortunately you want to take a photo of your kid playing baseball and you want to freeze time as he swings the bat. 1/60th of a second just isn't quick enough to capture that. Don’t fret just put your camera into manual mode and we'll use the chart to figure out what we need to do to shoot it at a quicker speed of say 1/500th of a second. Start by counting the dots between 1/60th and 1/500th of a second. There are 3 dots and we're moving up, this means that we'll have to compensate either our aperture or ISO settings by 3 stops or a combination of the two. Remember since we're compensating for 3 stops up we need to go the other way on the other settings to reduce by 3 stops. We could either reduce our aperture by 3 stops to F2.8, or we could increase our ISO to 1600, or a combination of the two. Since we learnt earlier that it is always a good idea to keep the ISO a bit lower let’s only go one stop to 400, and then we'll drop the aperture to F4. As you see we move the opposite direction on the lines we're using to compensate. Another example, say we're shooting a flower up close but we want to blur out the background by having a shallow DOF. Lets say we know that we're getting a proper exposure at 1/125s with ISO 400 at F16. Because the aperture is so small our depth of field would be huge causing the background to remain in focus. What settings would we want to use if we knew increasing the aperture size to F2.8 would give us a nice blurry background? Count the dots, we're reducing the aperture by 5 F stops if we're going to drop from F16 to F2.8 so therefore we need to increase the other settings by 5 stops total. I'd say that for flowers we're again going to want to reduce film grain, also the fact that we're doing a close up of a flower means we want as much detail as possible. This means we should start by changing the ISO from 400 to 100 which gives us 2 stops. We still need another 3 stops so lets increase our shutter speed from 1/125th to 1/1000th . You see how this is working? It’s really not that hard at all. Ok so this is great if you know the proper exposure but say you found an old film camera in your grandpa's basement and it doesn't have a built in light meter to do the work for you. There is a trick called the “Sunny 16 Rule” that is very easy to remember. If it is sunny outside set your camera to F16 then set your shutter speed to 1/ your ISO. For example if you were shooting ISO 200 you'd set your shutter to 1/200. Now you know the proper exposure and can compensate from there by counting stops to get to any combination of settings you need. Ever notice how all these cameras, even DSLRs, have “program” modes like “Sports” “Indoor” “Outdoor” “Portrait” “Kids & Pets” etc ? Well since your camera never knows what type of subject you're shooting (yet anyways) they build in presets to at least give you a little control. This may not be exactly what your camera does since each manufacturer has slightly different methods but this should be close. These presets will often also change other settings such as the colour and amount of sharpening, however for the purposes of this document I'll only address what affects exposure. Sports. This will often raise your ISO and Aperture size to allow for a faster shutter speed, thus allowing you to freeze the action. Indoor. Will do the same as sports but adjust to a shutter speed that is safe enough for a hand held shot not to be blurry. If this still isn't possible it will turn on the flash. Outdoor. This will often lower your ISO and increase the aperture, since its bright outside you don't need the extra light sensitivity. Portrait. Depending on your camera it may lower ISO to give you a cleaner image. Most often it just reduces the in-camera sharpening of the image so that it is softer, this doesn't affect exposure though. Landscape. Often this will try to set a smaller aperture to allow for a greater depth of field. This setting will also normally enhance green and blue colours for more vivid skies and trees, again this does not effect exposure. Kids & Pets. Both of these subjects tend to move fast and unpredictably, like the sports setting it will open up your aperture and increase your ISO to allow for a quick shutter speed. All cameras are different, take the time to fool around with yours and see what it is doing. Now that you understand how the shutter, aperture, and ISO work you should be able to figure out what your camera is doing when you put it in one of these auto modes just by looking at the image information after you take the picture. That's it for this edition, now stop reading and get out there and start shooting!